I used to love listening to talk radio. There was a local guy that I enjoyed listening to, but one day he switched his format. Instead of merely discussing news events, he decided to bring divisive topics each day and just let people argue. His show began to be about stirring up a hornets nest where no one could win, and it caused people to dig their heels into their position. It was no longer a place for dialogue and the show became something I no longer wanted to listen to. I’m guessing I wasn’t alone because it was canceled not long after that. As Christians, we need to be careful that we don’t fall into that same trap. We don’t want to be known as people who argue over every little thing, especially to the point where we refuse to listen. At times, it feels like our goal is to win the argument rather than to win the lost. It’s one thing to have a dialogue with someone about why you believe what you believe, but another thing entirely to look for divisive arguments with others. We’re to be known for our love rather than our debating skills. Paul warned Timothy about this in 2 Timothy 2:23-24. He said, “Again I say, don’t get involved in foolish, ignorant arguments that only start fights. A servant of the Lord must not quarrel but must be kind to everyone, be able to teach, and be patient with difficult people” (NLT). That’s a challenge for you and me in today’s world. Everyone seems to be divided on everything, even in the Church. We’re not to go around and start fights, but to find a way to teach people the truth in a way that they’ll listen. What good is it if we win the argument, but lose the war for their soul? When we start from a place of love rather than trying to be right, we’ll find more open doors to share our faith. We started our fourth day in Myan. We picked up right where we left off. One team went back in to keep painting and the other team went to finish staining the bed rails in the girl’s rooms. A group of freshly hired nannies showed up for orientation. They started with prayer and a beautiful song. While they met and others painted in the same room, I began cleaning paint off the floor with a few others. As I scrubbed, I began to think how my own sins have stained my life. I’ve tried to wash them off on my own with limited results. Nothing I do can ever erase them, but God’s love, like the paint thinner we were using, can wipe away the stains. As the day progressed, it got hotter. The wind wasn’t blowing either which made for a tough day. When we got through painting the walls and the others were through staining, we met outside to play with the kids. Everyone stayed on the porch in the shade. As I walked around, I saw three small children taking a nap on a blue carpet outside of their room. They were so peaceful. 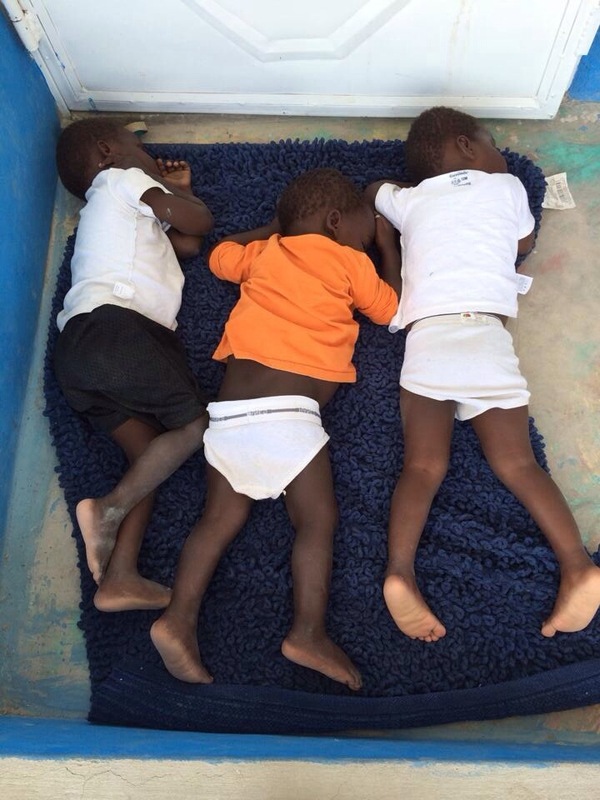 When I got on another porch, I found more orphans asleep on the chests of our team members. I thought of the rest we get when we trust God fully in our lives. When the fires come and life gets hot, we can rest assured that God will take care of us. We just need to crawl up on His chest to rest in the assurance of who He is. In the early afternoon, we came back to the guest house to grab a sand which, grab things for the Gonaives orphanage and to get some reprieve from the heat. Not long after arriving at the orphanage, the kids, orphans and locals, all came running. We sat them on a hill and one of our students told them the parable of the Lost Sheep. She told them that wherever they went in life, no matter what happened, Jesus would always be looking for them. We then played Marco Polo on the soccer field to illustrate the point. It wasn’t long until Marco Polo turned into a soccer match. In the evening, we came back to the guest house, cleaned up and ate my favorite meal here, roasted goat. We met on the balcony for service. God spoke during that time and challenged us to let go of the fear that keeps us from true worship. He wanted us to let go of the fear of what others might think and to let to of the fear that keeps us from talking about him. The students began to share what God laid on their hearts. They began to share why they came and what they wanted God to do. One said she was afraid she’d be a nobody in life, but found that no one who serves God will ever be a nobody. We are heirs to the King of Kings, princes and princesses. We all struggle with sharing our faith at times. If we can’t share with other believers, how can we ever share with the world? We should be so full of Jesus that He leaks out of us wherever we go. We have to learn to let go of the fear of what others will think of us, push past that feeling like we’re going to explode and just speak. God will do the rest. It’s not our words that change people’s lives. It’s His love and His spirit that draws them in. We are merely vessels used by Him. We only work when we’re full of Him, are willing to open up and are poured out. Don’t be afraid. Let Him use you today. 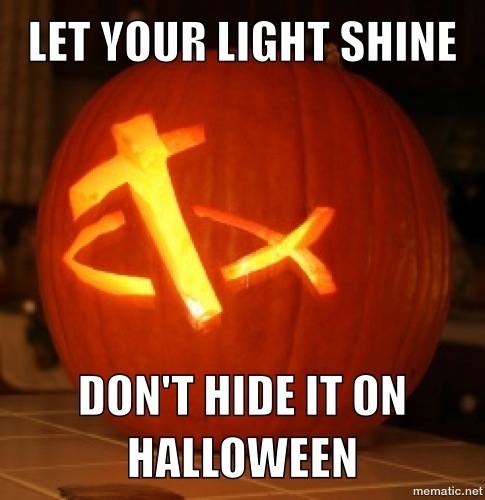 Every year at this time, I’m amazed at how many Christians are scared of Halloween. They believe that in partaking in it, they are partaking in witchcraft or celebrating the devil’s holiday. I get it if they don’t want to dress up and go knocking door to door asking for candy. What I don’t get is sitting at home in the dark with the lights out hoping no one comes and knocks on their door. To me, that is the opposite of what Christians should be doing. We should have the most lit up yard and offer the best candy available. We should have a table set up in our driveway and be sitting out there hoping others will come join us in conversation. Jesus said to keep an open house and to be generous with your lives. He didn’t tell us to hide our light and to give in to darkness. He told us to do the opposite. If there is no light, there can only be darkness. Why would we hide our light on a day where it is needed most? To me, that is falling into the enemy’s trap. He wants you to hide your light. He wants you to close your door. He doesn’t want you talking to your neighbors because they might hear you open up and talk about God. Jesus said that when you open up to others, you’ll prompt them to open up to God. Most of us are scared to go door to door to share our faith. There may be people in your church who do it, but it’s not something most of us would ever do. We make excuses, we tell ourselves it’s ineffective, we say it’s offensive and we don’t want to push people away. Yet tonight, you don’t have to go door to door witnessing. You have people coming to your door hungry, looking for something more than candy. They’re looking for Light to see whose door to knock on. Oddly enough, the ones who bear the true light are cowering in darkness. They’re putting their light under a bucket while the lost search for light. You don’t have to celebrate Halloween tonight. You don’t have to dress up. But I believe you are playing into the enemy’s hands and doing the opposite of what God has called you to do if you turn off your lights and hide. We are called to be salt and light. As Jesus put it in Matthew 5:13, “If you lose your saltiness, how will people taste godliness? You’ve lost your usefulness and will end up in the garbage.” Don’t lose your usefulness tonight. Let God use you to build relationships with your neighbors, open up conversations and to talk to others about God. Don’t run and hide, stand and shine.